Way back in the good old days, I had a 1.2m dish with dipole feed for 9cm but there would be no way of supporting this on my light weight mast, I needed a light antenna with low wind resistance. I have previously made G3JVL loop antennas for the 23 & 13cm bands, and a quick check on the Web showed that the design could be scaled for the 9cm band. I ran the G3JVL program and chose 12mm diameter for the boom thickness as a compromise between boom rigidity and the coupling effect of the boom on the loops. 12mm diameter aluminium tube was readly avialable in 2m lengths, however the coaxial feed cable to the radiator element needs to be grounded, where it passes thought the boom to form the balun. 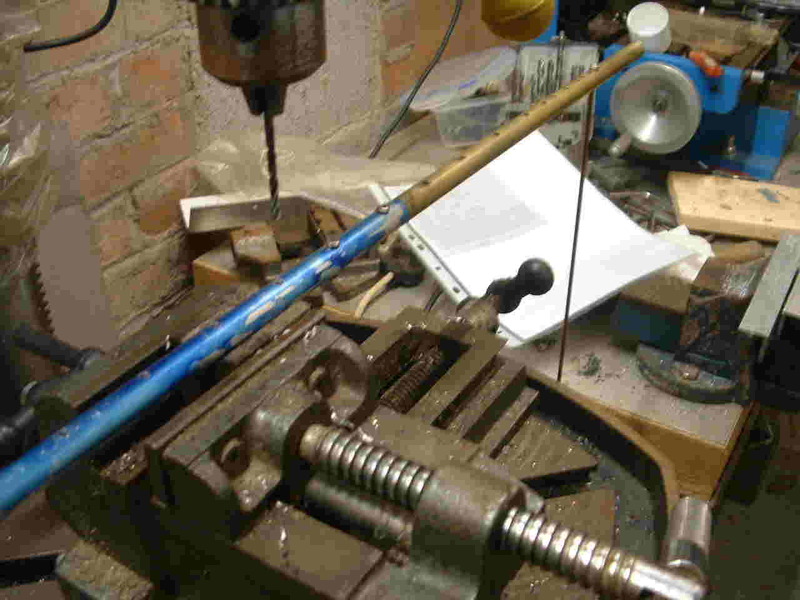 This is much easier to achieve if the boom can be soldered, brass or copper is an obvious choice. To save weight, I have made the back 300mm in brass tube and turned a stainless steel pin to be a good fit inside the boom tubes. Total length is 2.3m which gives a space for 60+ elements !. The stainless joiner is silver soldered into the brass tube and a a brass plug is also silver soldered in and taped to take a bolt to fix the rear plate reflector The elements are formed using 1.6mm brazing rod.You can solder the formed loop to a 3mm bolt but I decided to drill a 1.7mm hole through the end of 1/8 inch diameter brass rod and silver solder the loop joint inside the hole in the brass rod.The rod is cut at 18mm from the loop and threaded 3mm to take a nylock nut. Note that 1/8 inch diameter is a little large for 3mm thread but just file a taper to get the die started. Drilling the boom with the aid of a vertical alignment rod. Drilling the boom is a potential disaster area using round tubing !!!! Unless you have a pillar drill and V block stick to square section.It is almost impossible to mark a straight line along the 2m boom with such a small diameter tube. Mark the distance position of the holes along the boom from one end, NOT from one hole to the next. My technique for drilling is first set the V block positon to accurately drill through the centre of the tube with the drill bit close to the end of the V block thus avoiding drilling into the V block itself. Drill just the first end hole.Place a short length of 3mm rod through the drilled hole such that most of the rod is stuck out one side,solder or tap a nut to the end to stop it dropping all the way through the hole. Move the tube along the V block to drill the second hole and subsequent holes with the rod vertical. There are numerous methods of mounting the boom to the mast but all must avoid any fixings protruding into or close to the loop elements. I have used a 200mm length of aluminium angle to take a standard U bolt clamp. Three 5/8 inch diameter aluminium stand off supports were drilled to accept the 12mm diameter tube, careful this is a large drill with the resultant. 1/16 inch wall thickness.Long 6BA bolts clamp the tube through the spacer to the angle section.The top of the spacer is drilled so that the head of the bolt tightens on the boom not the end of the spacer. Semi rigid coaxial cable feed (141) to radiator element. I used a length of 141 semi rigid cable to feed the radiator element and soft soldered the outer to the brass boom. I had a length of cable which had a 90 deg bend already formed. I soldered the inner and outer to the loop element first and then soldered the outer where it passed thought boom.There is always some expansion of the dielectric with soldering and the copper outer split where it had been sharply bent. On my second attempt I left the cable straight and bent it after it had been soldered, no problem this time. 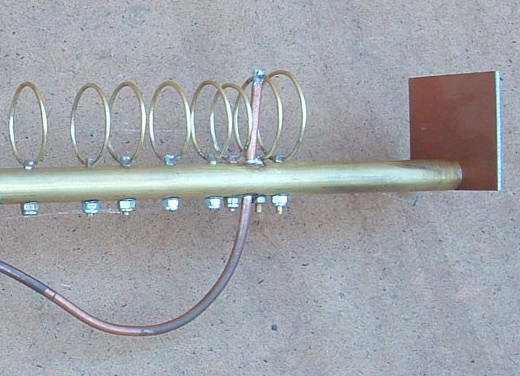 As of January 2016 I have a usable antenna with 14 elements, progress on making the remaining elements is slow.